A city is a community formed by city residents, and the role of the city administration is to answer their needs and ensure their conditions for success. Changes in the community and its operational environment require the administration to adapt to the new circumstances. 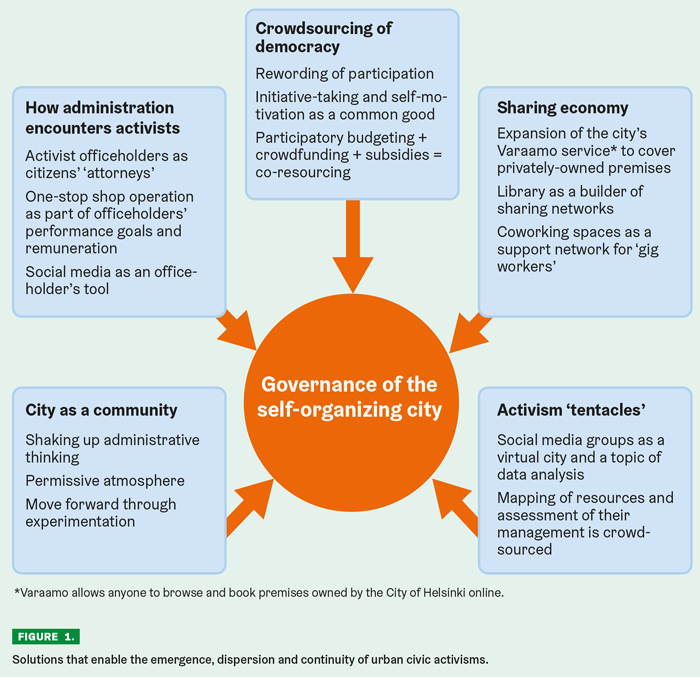 In our previous article (see Helsinki Quarterly 1/2017) we discussed today’s urban civic society and its new actors, methods and roles that are based on independent self-organisation. These we have termed urban civic activisms. We have characterised this new section of society as a fourth sector to which the city administration should, and eventually must, adapt. Identification of the resources of the civic society, strengthened by digitalisation, is necessary for achieving the strategic objectives of cities, such as ecological sustainability, participation of communities and individuals, and the vitality of neighbourhoods. In the present article, we will locate areas of activity on which cities of the metropolitan area, particularly the administration of Helsinki, should focus in order to adapt to the ‘fourth-sector’ urban community in a coherent way. We will deal with challenges related to reforming city governance as well as some solutions to these challenges. We will present a model of hybrid governance as a desired state of city administration and will attempt to describe the steps leading towards this goal. A city organisation can enable people’s self-motivated and self-organising activism successfully if it invests on the development of both its practices and operating culture. This requires new vocabulary, not only for adopting the new culture within the administration but also for communicating it to the urban community. One of the key measures we propose for the city is to put the following terminology to test when setting the goals for the administration. In Helsinki, one opportunity for doing this is while translating the city’s new model of participation into concrete operative instructions for officials. The concept of urban civic activism directs attention to action, the diversity of actors and to the possibilities these activists bring to the development of cities. The challenge with this concept is that it is too easily equated with the traditional role of a citizen. However, people can function in an activist-like, ‘fourth-sector’ manner also in their professional roles – that is to say, by acting for the benefit of communities beyond one’s own job description. A city official can be an activist, too. One can strive to avoid the image of separation between city residents and the city administration through a discourse where these are understood as one single urban community. With the rise of urban civic activisms, the concept of participation must be understood in more diverse terms than before. City residents’ participation in the development of their own city and living environment emerges on a more extensive scale than previously. The possibility to influence local affairs through administrative preparation and policy-making is, for many, a cornerstone of participation, but there are also more direct ways for participating and making a difference – such as when people help one another, engage in peer-to-peer transactions, act for the benefit of their community, or finance local projects. Not everyone needs to be an activist but, through their actions, activists also create conditions for the participation of those who are less active (see also Idström 2016). The tendency of city administrators to talk of residents when referring to local people portrays them in a rather restricted role. People not only live in their neighbourhood but are also engaged in various activities in the neighbourhood, and in relationship with it. Moreover, the word ‘resident’ ignores the entrepreneurs and employees working in the area, or people taking part in leisure activities there, although all of these are also actors in the community. The Finnish word kaupunkilainen (literally ‘one of the city’) is a useful term because it refers to a person without emphasising the aspect of residence. The same applies to the word ‘local(s)’. Another problematic Finnish term sometimes used as a synonym for ‘participation’ is osallistaminen (literally ‘making people engage in an activity’), because this word strongly implies the role of the public authority as an organiser (Westerink et al. 2016). Instead, it would often be more precise to speak of crowdsourcing in the sense that virtually any one can be a ‘crowdsourcer’. This would support a detachment from top-down thinking. The term ‘volunteer work’ is usually linked to participation in activities arranged by a non-governmental organisation (NGO) or a public administration organisation. In matters of taxation, similar activities are referred to as mutual aid. Such words are not ideally suited to capture the nature of urban civic activisms, and they should be replaced with terms such as community activity and sharing of services. The latter type of vocabulary would be helpful in managing these new forms of activity more coherently. To enable urban civic activisms means tearing down obstacles to such activisms and creating preconditions for the emergence, dispersion and continuity of activisms also in the long term (Figure 1). This requires special investments in the development of a permissive atmosphere and readiness for experimentation. Many activisms fade out or do not emerge because the actors are needlessly afraid of running headlong into bureaucracy. We propose permissiveness communication in order to quell the fear of bureaucracy. This can be launched as a campaign designed together with activists, thus taking the first steps towards establishing ‘permissiveness communication’ as part of the everyday communications of the city authorities. Part of this campaign can consist, for instance, of explaining what activities are already allowed (and being done) in the city without any official permits. Successful encounters between activisms and authorities require interaction in the places frequented by activists, social media in particular. We propose that city organisations invest in the use of social media as an instrument of communication and, first and foremost, interaction and the production of information. As key measures, we suggest providing social media training for officials, ensuring support from management, and reserving time for public employees to work in social media. Matters under preparation should be opened for public perusal once they have been instituted, and they should be suitably communicated in social media from the start. 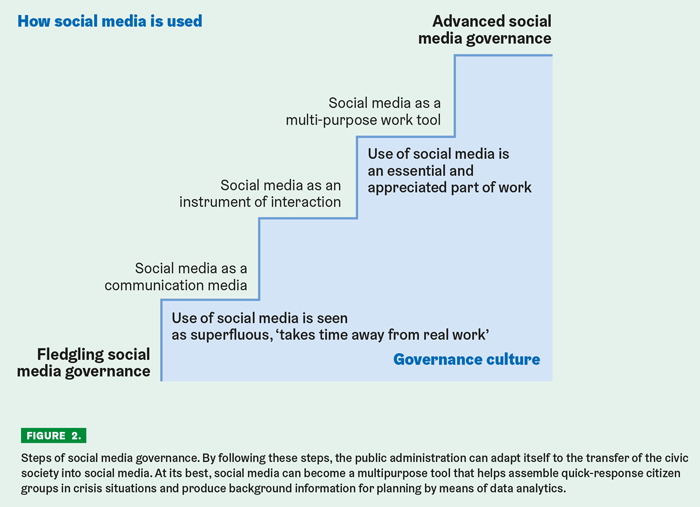 The roadmap for social media governance that we describe in Figure 2 can be used to help the setting of goals for utilising social media. Not all public employees need to be ‘social media pros’, and they do not have to jump to the top in one go – initiating the learning process is the key thing. The city administration can also strive to meet activists outside of the online sphere, for instance through a regular series of meetings in the mould of the Helsinki Loves Developers ‘open-door office’ events. Various budgeting and design workshops can also be arranged, inviting service providers from the ‘fourth sector’. For identifying resources, the city organisation needs ‘activism tentacles’ – ways to detect budding activisms, or the potential and preconditions for the creation of such activisms. As measures, we propose a survey of the urban community’s resources and an assessment of these resources, and we advise that such surveying is conducted constantly and by means of crowdsourcing. Helsinki has already experimented with outreach models with which these surveys could be coupled, such as the youth department’s district surveys. This survey data can be produced through an open resource barometer that compiles quantitative and qualitative information, of which Helsinki’s youth welfare reporting is an example. The rise of urban activisms entails that the city authorities should adjust their democratic principle of equal treatment of city districts, so that the principle would not automatically preclude them from making use of potential activism resources in certain areas. Resource thinking can be hoisted to the side of democracy thinking by adopting a practice in which solutions are always weighed also in terms of the usability and renewability of the resources. In city planning, resource sensitivity means, for instance, that alternative plans (drawn up by groups of citizens) are identified as carrying more weight than an individual opinion. The city organisation can balance the residents’ varying possibilities to take part in city planning by introducing support services available for everyone, such as allowing resident groups to ‘borrow’ professional planners, or fostering networking, or providing material packages and printing services. The leading idea in the shift to a better utilisation of activisms can be an orientation towards a sharing economy and decentralised co-production, which allows many other actors and platforms besides the city organisation to produce services and information, and organise crowdsourcing and planning. In this framework, the city’s own under-utilised resources are made more widely available and the emergence of citizen-led sharing networks is supported. As measures, we propose extending the Varaamo service (which allows premises owned by the City of Helsinki to be booked online by private individuals and groups) to cover also private facilities, and developing libraries as hubs of sharing activities. The communications staff of the city can provide assistance for activisms that require more visibility in the urban space or online. This could help co-working spaces, for instance, to secure a sufficient number of users, allowing continuity for such services. Similarly, free server space provided by public authorities can be of significant help to some citizen-led platform economy services. The operations of an administration that supports urban civic activism may seem like a radical change compared to a ‘traditional’ public administration, but are they really that different in light of recent history? The urban governance discussion that has been going on in urban research since the 1990s has referred to a descent of public power from its former sovereign position to a more levelled network of partnerships, cooperation and negotiation with other operators (see e.g. Sager 2012). At the same time, the academic debate – focussing on the state of democracy and sustainable development – has also highlighted concepts such as civic engagement and participation, or more specifically the need to intensify the interaction between citizens and administration (see Kettunen 2002; Bäcklund et al. 2002). By the early 2000s, innovation policy had become an important part of urban development through themes of information industry, the creative class and metropolitan politics. The concept of triple helix in innovation policy was expanded to the customer-oriented economy and augmented into a ‘quadruple helix’ that acknowledges a strong civic society (Kanninen 2005), thus spawning an innovation environment thinking that highlights the local aspect in the spirit of the quadruple helix. (Schulman & Mäenpää 2011.) The 3P partnership model of real estate development that emphasised the customer-oriented economy was expanded to a 4P model (public-private-people partnership) (Majamaa 2008). In the field of city planning, there was discussion of co-creation which was derived from a communicative, participatory planning paradigm and which also led to design-focused thinking emphasising user orientation. The discussion of urban civic activism as a resource of urban development can be understood as deriving from all these discussions. The question of city residents’ participation is linked to the city’s ability to adapt and create something new, in the conditions of deepening, technical-economic-social digitalization. Therefore, the challenge created by urban civic activism is not an entirely new subject but a continuation of previous development towards a stronger position for city residents in urban development. This challenge culminates in the ability of cities to merge the dimensions of participation and innovativeness into a goal of urban policy that is democratically legitimate and can be operationalised as administrative processes. A description of the desired state of a self-organising city can be started in terms of the relevant concepts. In analyses that focus mainly on city planning, the conceptual premise is usually co-planning or co-design, whereas the concept of co-governance is often used in analyses with a broader scope. (Horelli 2013.) The latter term refers to a paradigm in which the administration shares its formal decision-making power with communities. Definitions focussing on the concept of partnership, on their part, tend to emphasise contracts between the parties. For our analysis, with its emphasis on the ‘fourth sector’, neither the sharing of decision-making power nor the contractual basis of cooperation would appear relevant for describing the conceptual structure. As a conceptual premise, we propose the term hybrid governance, deriving, on one hand, from the concept of hybrid organisation arising from organisational studies (Billis 2010) and its derivative hybrid administration (Heinonen & Ruotsalainen 2017), on the other hand. A ‘hybrid organisation’ refers to an organisation that mixes the elements, values and operating methods of different sectors of society. The futurologists Heinonen and Ruotsalainen, on their part, have developed a model of predictive hybrid governance that involves systematic and comprehensive activity by the administration in order to predictively understand its operating environment, taking into account and working together with the residents, their peer-to-peer networks and other local actors (op. cit.). Peer-to-peer networks largely refer to the same phenomenon as urban civic activisms, because these activisms typically comprise mutual, social media-based and principally non-hierarchical networks between peers. Specifying hybrid administration as hybrid governance means shifting attention from the system, the decision-making power and contracts to interaction processes. In our opinion, the concept of hybrid governance is best suited to describing the view of the future city opened up by urban activisms, not least because it involves a combination of operators, operating methods and processes that are diverse and not commensurate in terms of values and operating logic. Urban civic activists often seek cooperation with different parties, including the city administration, but they do not wish to melt their identity and operating methods with those of others, fearing that they would thus diminish their own role as actors. Primarily, these informal communities want to remain communities, and peer-to-peer networks want to remain peer-to-peer networks, cherishing their communal identity, values and operating methods – sometimes this seems to be an end in itself. Operation of the fourth sector is, by its nature, occasional and usually does not constitute an established partner for the city organisation. The local authorities, on their part, cannot share responsibility for decisions with these civic actors, and cannot make legally binding contracts where the other party is not a legal entity. This is why hybrid governance describes the paradigm better than co-governance or partnership. Hybrid governance should not be approached as an ideal goal of development but rather as multilevel readiness to act together with the fourth sector in a coherent way. The city authorities can move towards the operating methods of hybrid governance on a case-by-case basis, learning and experimenting. 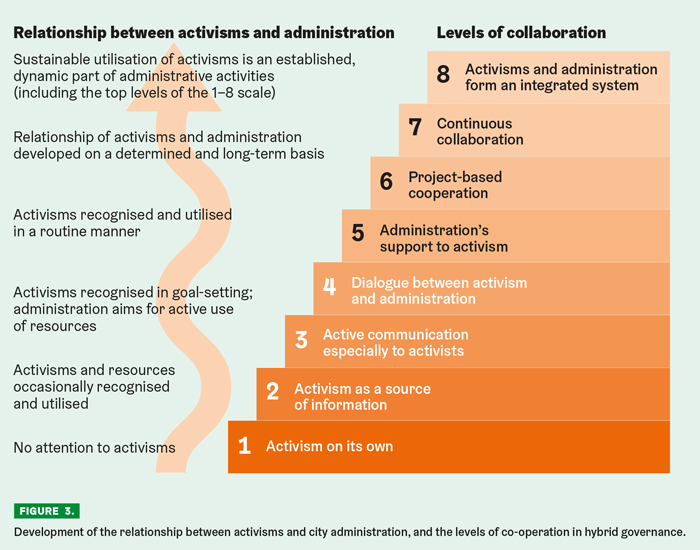 Figure 3 describes a possible progress in the utilisation of urban civic activism in city administration as well as the corresponding levels of co-operation on the way to deeper hybrid governance. Even at its most advanced level, hybrid governance must remain porous to the extent that the city administration can choose the approach it applies on a case-by-case basis. Sometimes the authorities may need to assess if it is reasonable to restrict their role to simply fostering a permissive atmosphere – for instance, when dealing with strongly ideological actors. In other cases, a more supportive and more enabling approach can be taken, such as when dealing with the new kinds of neighbourhood movements. These are a valuable partner alongside with the more traditional district associations and clubs in the formation of the neighbourhood community, including as a source of information and as representative bodies. An example of deeper hybrid governance would be, for instance, linking participatory budgeting with a crowdsourcing campaign that creates local services. Figure 4 shows what the levels of collaboration can signify in practice, in three different cases. In the examples cited in the figure, the City of Helsinki currently operates mostly at levels 1 to 3. In spring 2017, the Public Works Department gave the REKO food distribution network in the Viikki district a free event permit as a precedent, in line with earlier guidelines given by the authority administering market squares in Inner Helsinki. In the field of peer-to-peer lending, the city libraries have acted as a hub for the Kuinoma peer-to-peer service. Furthermore, the officials in charge of city planning regularly take part in planning-related discussions in social media groups and utilise them as a channel for civic engagement. In these groups, the officials discuss with alternative-planning activists, comparing the city’s own draft plans and ‘shadow’ plans drawn up by the activists. As a question of urban policy, the challenge posed to cities by urban civic activism and the fourth sector largely reverts to digitalisation, and it represents the more recent social-technological phase of digitalisation that has followed the initial technology-oriented stage. The fourth sector grows from the ability of internet platforms to enable and foster communication, interaction, like-mindedness, self-organisation and activity in a cultural atmosphere dominated by the spirit of hacker ethics, information sharing and co-creation (see Himanen 2001), as well as ethical thinking linked to sustainable development in different ways. As a result, the city community begins to consist of urban operators and their networks instead of ‘residents’ and ‘customers’. The subject of governance changes, and a new concept of democracy as empowerment for direct participation in developing one’s own living environment is attached to that subject. Peer-to-peer networks generated by a digitalisation that extends its tentacles ever deeper into society, as well as their sharing-based platform activities, must be accepted as the new logic that reconstructs urban societies. This means that the city can no longer be developed with a slavish devotion to geographic equality, because the fourth sector does not rise and operate in the same way in all districts and at all times. Otherwise, too many of the urban communities’ resources end up wasted. The city authorities can still act like rain that nourishes the entire cityscape. But it must also learn to be a sun that, according to the ‘topography’ of the urban community, shines on different places in different ways, in concordance with how each of these spots seems to flourish. In addition, the local public authority must act as a gardener who can pick the best plants and plant them in new locations, understanding where each flower will bloom and knowing how to make a tree growing from a sprout to bear fruit. Pasi Mäenpää is researcher and adjunct professor at the University of Helsinki Department of Social Research. Maija Faehnle is senior researcher at the Finnish Environment Institute SYKE and also works for the University of Tampere. During the project on which this article is based she was Mäenpää’s colleague at the University of Helsinki Department of Social Research. Billis, D. (ed.) 2010. Hybrid Organizations and the Third Sector: Challenges for Practice, Theory and Policy. Basingstoke: Palgrave Macmillan. Bäcklund, P. & Häkli, J. & Schulman, H. 2002. Osalliset ja osaajat. Gaudeamus, Helsinki. Heinonen, S. & Ruotsalainen, J. 2017. Tulevaisuuden kaupungit rakentuvat vertaisvoimin ja ennakoiden – hybridihallinto kansalaisten apuna. Futura 2/2017. Himanen, P. 2001. Hakkerietiikka ja informaatioajan henki. WSOY, Helsinki. Horelli, L. (ed.) 2013. New Approaches to Urban Planning - Insights from Participatory Communities. Department of Real Estate, Planning and Geoinformatics. Aalto University publication series SCIENCE+TECHNOLOGY, 10/2013. Idström, A. 2016. Katsaus demokratiaa ja osallisuutta käsittelevän keskustelun nykytilaan. Tutkimuskatsauksia 13/2016, Helsingin kaupunki, Tietokeskus. Kanninen, V. (ed.) 2005. Neloskierrettä kaupunginosiin - Kumppanuudet ja roolit alueiden kehittämisessä. Kulttuuriasiainkeskus, Helsingin kaupunki, Helsinki, 69–81. Kettunen, P. 2002. Miksi osallistumisesta puhutaan? Osallistumisen kehittäminen suomalaisissa kunnissa. In Bäcklund, P., Häkli, J., Schulman, H. (eds.) Osalliset ja osaajat. Kansalaiset kaupungin suunnittelussa. Gaudeamus, Helsinki, 18–35. Majamaa, W. 2008. The 4th P – people – in urban development based on Public-Private-People partnership. TKK Structural Engineering and Building Technology Dissertations: 2 TKK-R-VK2, Espoo. Sager, T. 2012. Reviving critical planning theory: dealing with pressure, neo-liberalism, and responsibility in communicative planning. Routledge, New York. Schulman, H. & Mäenpää, P. (ed.) 2011. Kaupungin kuumat lähteet. Helsingin metropolialueen innovaatioympäristöt. Helsingin kaupungin tietokeskus, Helsinki 2011. Westerink, J., Kempenaar, A., van Lierop, M., Groot, S., van der Valk, A. & van den Brink, A. 2016. The participating government: Shifting boundaries in collaborative spatial planning of urban regions. Environment and Planning C: Government and Policy 35:1, 147–168.